Successfully Added Odyssey - WiFi Quadband Dual-SIM Cellphone w/ 3 Inch Touchscreen to your Shopping Cart. Following on the huge success of its predecessor, The Voyager, we're proud to introduce The Odyssey, an unlocked, dual-SIM, quad band world phone with every modern cellphone convenience imaginable, such as Wi-Fi and bonus 2GB microSD card included free! The Odyssey is a first class quad-band mobile phone that supports the four global standard GSM frequencies (850MHz, 900MHz, 1800MHz, 1900MHz) so you can trust it to work anywhere in the world. It has two SIM card slots which is perfect for people who want to keep two active phone numbers (personal and business) inside one great phone! Select the connection you want and click "connect"
...and checking email and surfing the Internet with ease! The Odyssey effortlessly takes you online wherever a hotspot or wireless connection is available (which is everywhere these days!) - coffee shops, airports, libraries, restaurants, etc. And with its stunning array of web services like Google Maps for navigation, eBuddy which consolidates all your email and instant messaging accounts, and convenient add-ons like Gizmo5 which allows you to chat and talk for free or next to free using Wi-Fi, you've got more than a mobile phone in your hands - you've got a global communication device! That's not all! The CVDQ-M56 comes fully unlocked, meaning you can use it with any cell carrier or network you want. It's got Bluetooth (which allows you to pair your phone with tons of devices like handsfree headsets), POP3 integration (which lets you sync the phone with various email platforms), and even accelerometer motion control! Shake the phone to change the TV or radio channel, wallpaper, song track playing, or picture viewed. How's that for multifunctional mobility? Ruggedly constructed and stylishly designed, The Odyssey takes cellphone convenience to a new level with a host of PDA features and plays all your favorite text, picture, audio, and video file formats! Best of all, this phone comes with a 2GB TF / microSD card so you've got lots of storage to play OR create media - yes, the CVDQ-M56 also features a front AND rear digital still and video camera for all those can't miss moments. Youtube video anyone? The Odyssey is a full-featured interactive intelligent cellphone with a stunning 3 inch touchscreen and slide screen main menu just like today's most advanced smart phones. Don't delay, click "Add to Cart" right away and in a few days you could be the proud owner of this state of the art WiFi ready dual SIM quad band touch screen mobile wonder! Brought to you by the leader in factory direct China electronics - Chinavasion. NOTE: This product is compatible with GSM at the four frequencies of 850MHz, 900MHz, 1800MHz, 1900MHz. This can be used throughout the world. Gizmo5 is a Skype alternative which allows you to free chat and talk with other Gizmo5 users or call non-Gizmo5 users on their landlines or mobile phones at a very low price. To learn how to install Gizmo5 on the Odyssey, read our blog post entitled: Gizmo5, A Review And Install Of The Number 1 Skype Alternative at blog.chinavasion.com. Functions as a webcam too! Use either a 2.5mm earphone or microUSB earphone for listening to music. This amazing phone accepts both types of headphone connections. 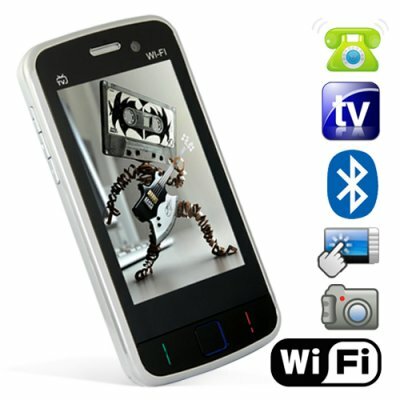 This is an excellent mobile phone and can be compared with the other popular phones in the market. It offers all the functions and operations that are very useful today (touchscreen, Wifi etc) and normally you have to buy an expensive phone in order to enjoy them.! Robust construction, slim with ...very good quality TV! Minor problem..no GPS receiver! on 2010-12-27 15:55:48 Very good! This phone is so cool my friends were jealous of it! on 2010-12-09 04:47:19 One Of The Best!! on 2010-10-28 02:17:13 Great phone for a good price. the only things are that the adapter got stuck after less then a month. but i bought a new one and thats good now. the other thing is that my touchscreen doesn't work very well anymore. i must write the letters. cause i can't type on the keyboard, cause the touchscreen works bad. i have this phone a month, so it got stuck very fast. but the phone is nice :P.